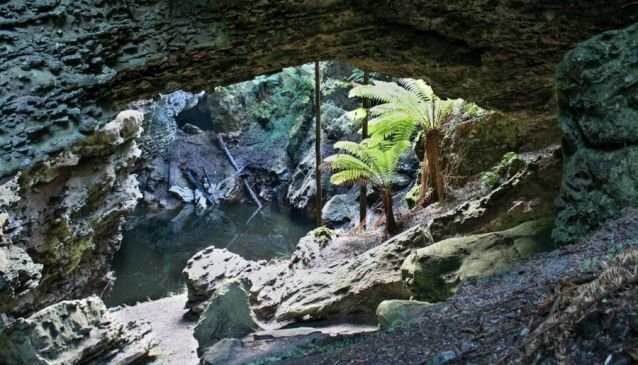 Trowutta Arch is a hidden delight just 10 kilometres from Trowutta, which is 25 kilometres inland from Smithton in Tasmania’s far north west. 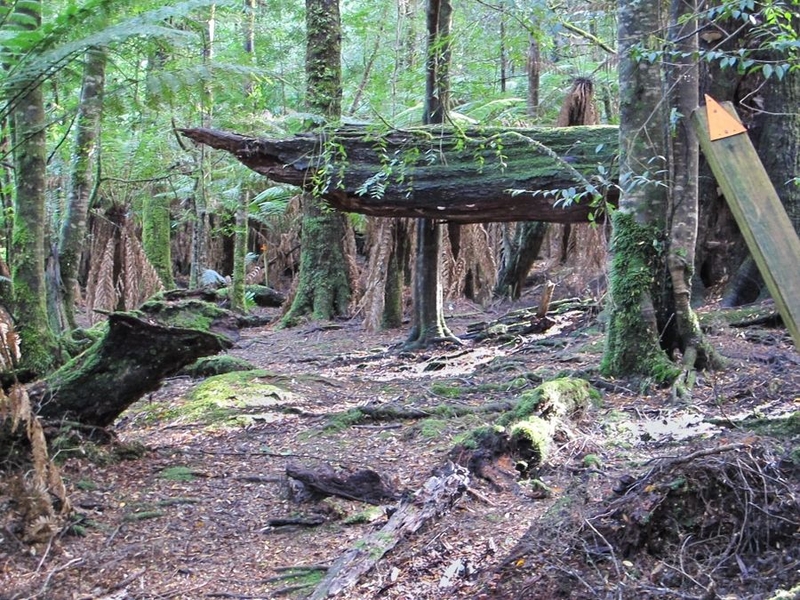 To be honest I’d never heard of Trowutta Arch until just a couple of years ago, despite spending the majority of my life living in north west Tasmania. This is the joy of discovery in Tasmania. A short section of gravel road takes you to the starting point for the walk. The fact that it isn’t a major stop for tourist buses was confirmed by the car park – a space at the side of the road, big enough for all of two cars! What struck me was that after walking for all of about ten seconds, the car and the road were no longer visible and we could have been in the middle of a forest, miles or from anywhere. There is the sense that you could be on a remote adventure that you walked for days to get to. The walk to Trowutta Arch is very flat and easy, only taking about 10 minutes. With very little understorey, the way was open and clear (and yet not clear), with myrtle leaves carpeting the forest floor, yet with the distinct smell of sassafras in the air. I’ve never felt myself to be a poor navigator, and think my sense of direction is ok, but I queried it on the walk into Trowutta Arch. Being not a high traffic walk, the track was not worn or clearly differentiated. Markers helped to show the way, but some of them took to hiding and a good scan ahead was needed to spot them. Sometimes when you were walking forward not having been able to see the next one, it was quite a sense of relief to spot one. The feeling that you didn’t need to stray far from the track and it would have been hard to find again added to the sense of adventure and remoteness on what really is a short, easy walk! Suddenly you reach the arch, with little advance warning. Down a bit of a slope and you find yourself looking through the arch, which is exciting – made it! The first impression is that it is bigger than it looks in photos. The sides are steep with some ferns growing on them and if the degree of incline continues under the water then the pool of water would be pretty deep. The darkness of the water led it to be quite reflective and beautiful. The arch was formed with the collapse and creation of two sinkholes either side of it. The area has many sinkholes and is part of the Trowutta Caves State Reserve. 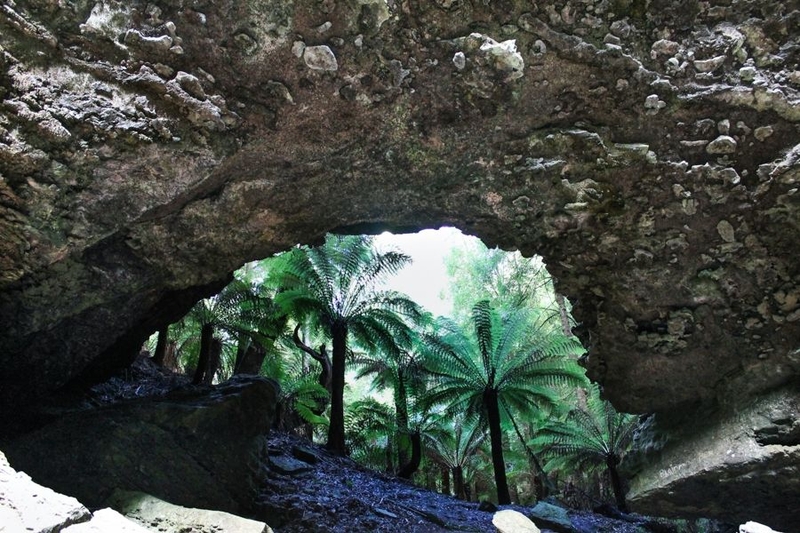 We enjoyed the ruggedness of the arch, the reflections on the water, the softness of the ferns and the mosses. 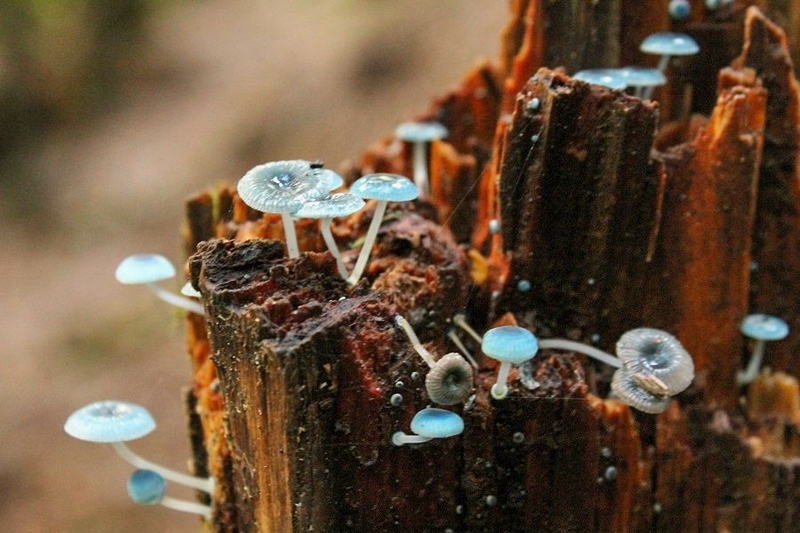 In the temperate rainforest there was beauty in the large trees and tiny fungi alike. There was delight in the stillness of the area, the peace of visiting a place of natural beauty and being the only ones there admiring it. To find Trowutta Arch, drive straight through the town of Trowutta and turn left on reaching Reids Road. After about a kilometre turn right onto Reynolds Road. After about three kilometres turn left onto Guns Road. 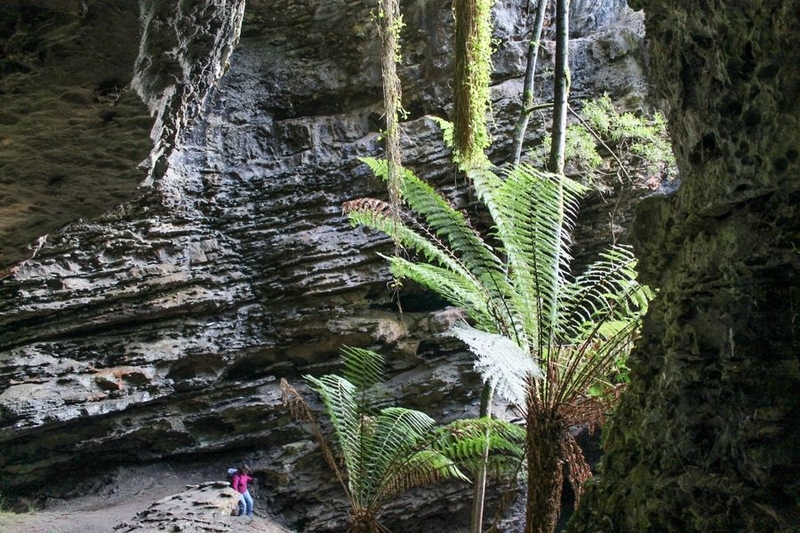 After a bit over a kilometre you will enter the Trowutta Caves State Reserve. Keep an eye out for the parking area on the right with a sign pointing into the forest on the left indicating the way to Trowutta Arch.